It is a North Myrtle Beach resort that is on the oceanfront and one that is full of spacious North Myrtle Beach condominiums. So when your family seeks a beach retreat where the sand is steps away from your accommodations and the amusements are right around the corner, you can make Beachmaster North Myrtle Beach resort your home away from home. This oceanfront North Myrtle Beach resort is in an area of town that is as famous for its fishing pier as it is popular for the salt water channels that permeate the neighborhood. Cherry Grove is a wonderful vacation destination for families and Beachmaster is a marvelous North Myrtle Beach resort. Beachmaster is a three-story North Myrtle Beach resort built on stilts. Stairs are conveniently located at either end of this North Myrtle Beach resort and are easily accessible from the covered parking area of Beachmaster. Most of the North Myrtle Beach condos in this oceanfront resort have direct oceanfront views. The corner North Myrtle Beach vacation rentals at this resort have especially large balconies that wrap around the unit somewhat. 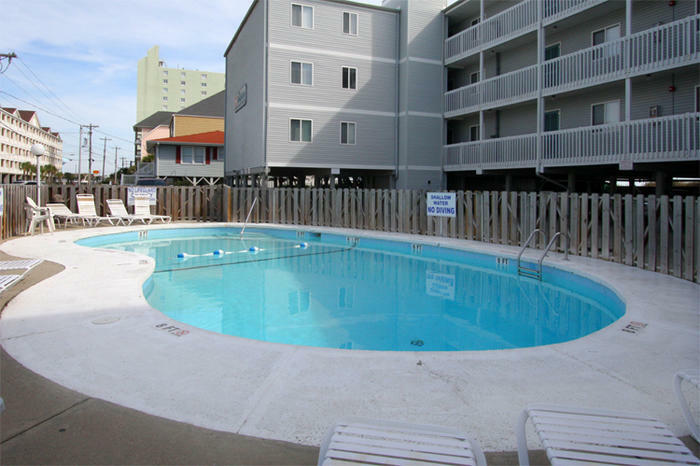 Some of the North Myrtle Beach rentals at this North Myrtle Beach resort have side views of the Atlantic Ocean. The sparkling blue swimming pool at Beachmaster is fenced in on the front of this North Myrtle Beach resort property. There are lounge chairs around the pool so you can fully relax while you get a tan. Soak up some laughter when you hang out poolside as the kids splash and play. This patio is paradise and a welcome respite for all ages during your North Myrtle Beach vacation. This North Myrtle Beach resort on the oceanfront boasts two-bedroom North Myrtle Beach condominiums. For your convenience, each of these condos in North Myrtle Beach, SC has two baths. Up to six people are easily accommodated in each one of the Beachmaster North Myrtle Beach vacation rentals. So whether it is a family vacation for which you plan or a golf retreat for you and your friends, the North Myrtle Beach condominiums at Beachmaster are a good fit for your beachfront getaway. Elliott Beach Rentals is not affiliated with onsite management or the HOA of Beachmaster.